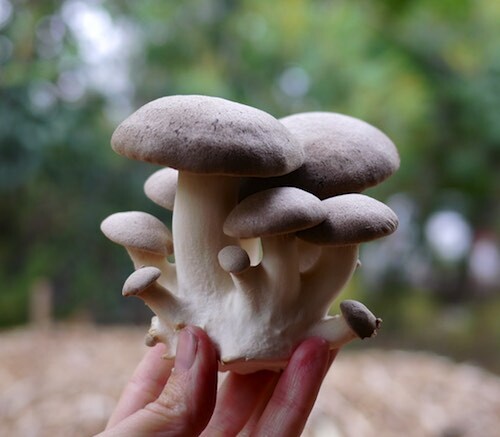 The future of small scale organic farming belongs to those who are willing to find a way to grow, regardless of where they begin from. Linda Machon is a perfect example of a farmer who has made the most of what, and where, she has found herself. 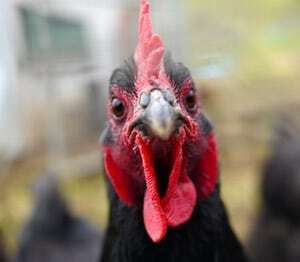 The concept of the multi-enterprise small farm makes good sense. High profile examples like the Polyface Farm system with multiple livelihoods and enterprises growing from a founding family farm have proven extremely successful. But can this idea work at a smaller, simpler scale? At Buena Vista Farm in Gerringong, NSW, it seems that it can. 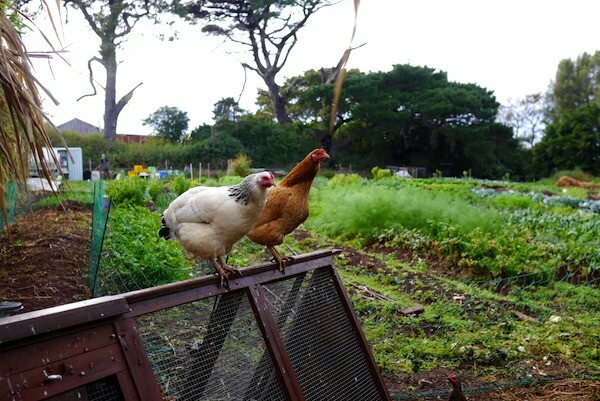 Buena Vista Farm is a small 18 acre organic farm with a big output – between their on-farm cooking classes, their wholefood + fermented products that are sold locally, and their egg and meat chicken systems, there’s a lot going on. 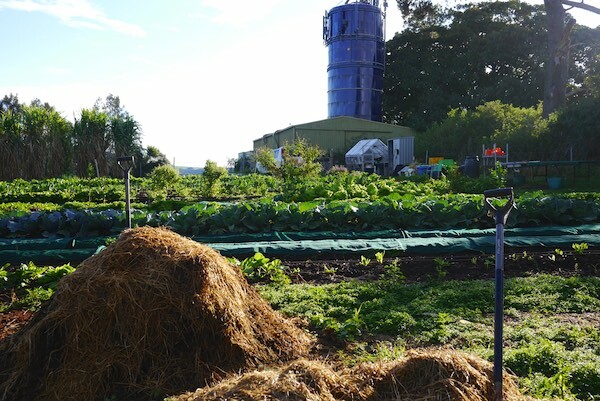 Growing on-farm vegetables was a natural progression, but the workload was a bit beyond Adam + Fiona Walmsley, given everything (plus three small kids!) that they were managing. 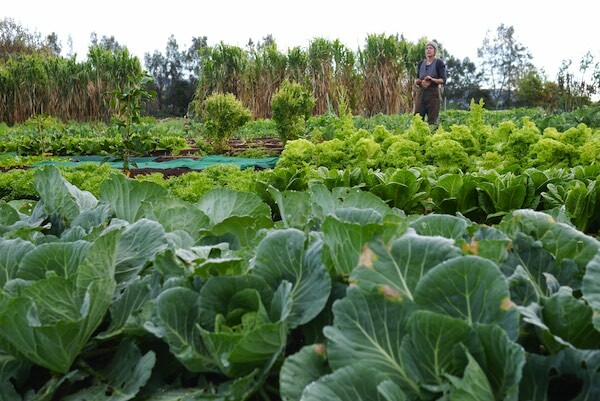 Enter the synergy of this small-scale plug-in enterprise – Linda’s market gardening business, Grow Farm Forage. 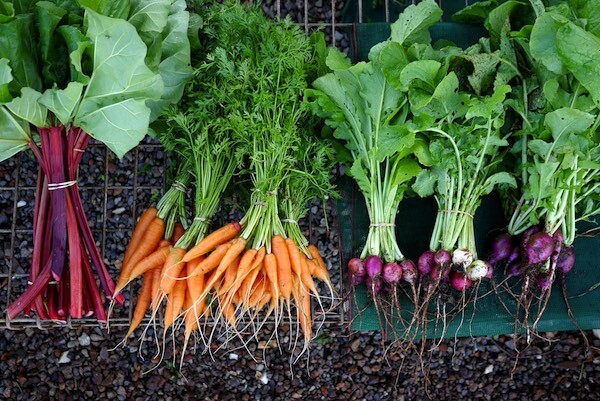 Growing: mixed vegetables – annual + perennial, edible flowers. 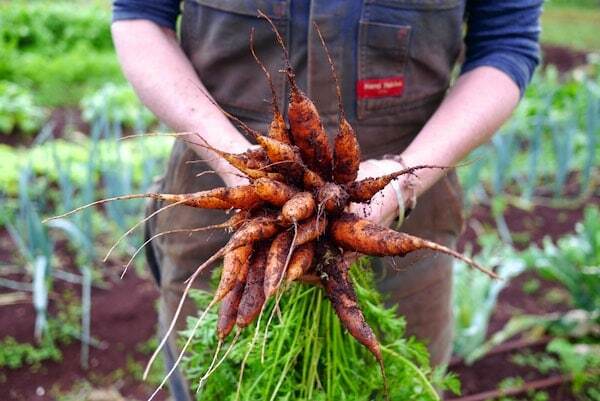 Soils: Red volcanic clays (‘plant a needle, grow a crowbar’ – ie very good). What’s the backstory to this market garden? Linda – so this garden was here already, in a sense. 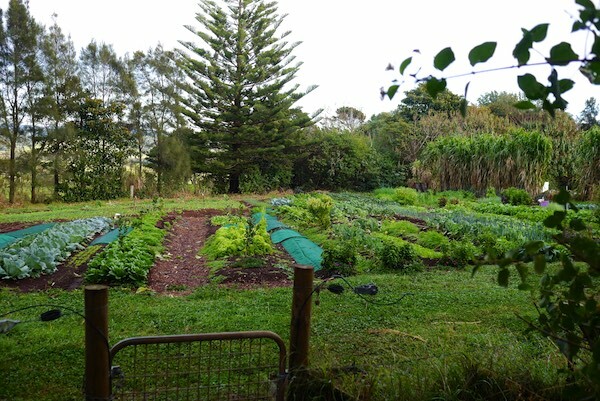 The land had been set aside for vegetables, the area had been pig tractored to clear the grass, and Adam had had two goes at growing things, ontop of the rest of his workload. As he says, this patch broke him. Just too much. 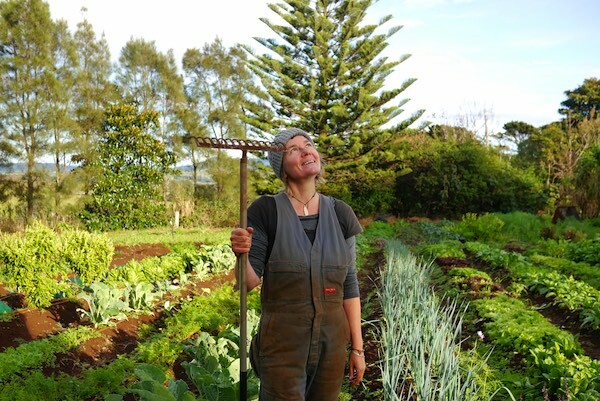 But both Adam and Fi felt that growing vegetables was an important component of the way they saw the farm system building, and so the arrangement came up through Milkwood (we knew Linda as a student and friend looking for land, and so put her in touch with Adam + Fi). 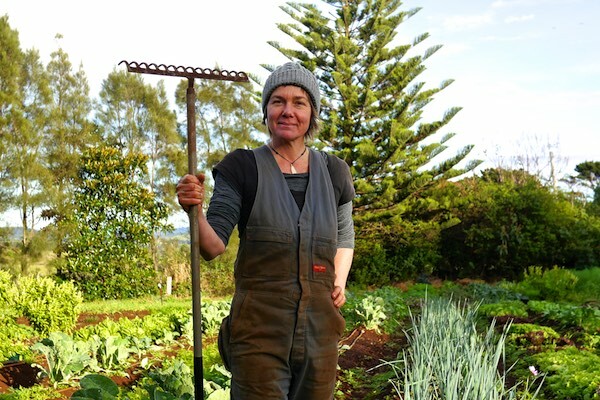 I said ‘I’ve never been a market gardener’ – I’d mostly worked with animal systems up until that point – in the Byron Bay region and in Europe, but the Buena Vista crew didn’t mind that I hadn’t grown veg commercially up until that point, partly because I was keen to work with them on their animal systems too. I have my own loft to live in here, so the deal is on-farm accommodation + eggs and meat when available, in return for animal system chores and land access for growing. 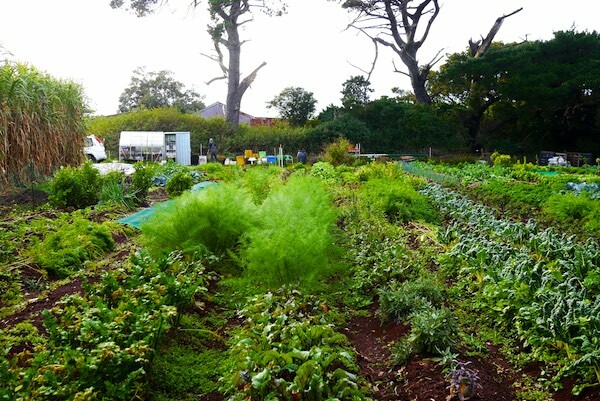 In return, Adam and Fi pick whatever they want from the garden to feed their family, and their on-farm cooking classes. 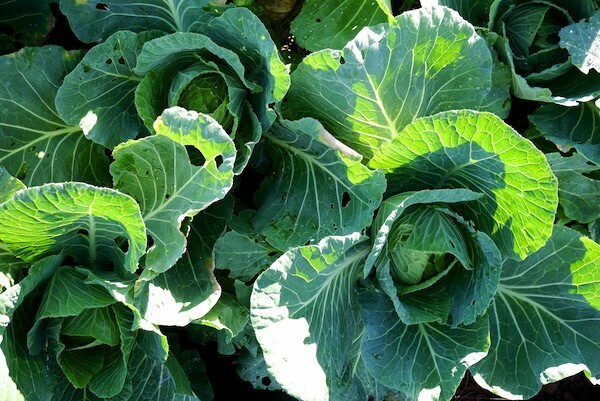 I also grow extra cabbages as the season allows to add to the famous Buena Vista Sauerkraut that’s sold locally. 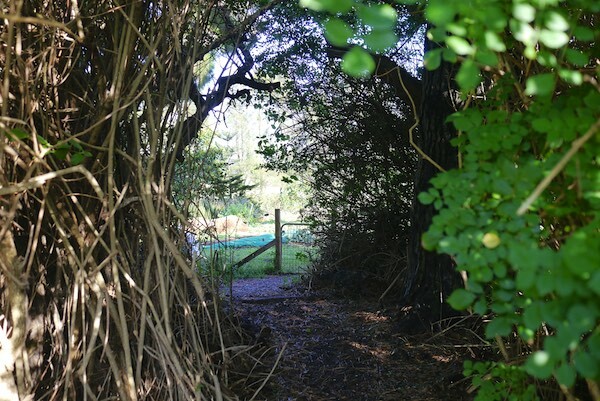 Infrastructure – in this market garden our arrangement is that the farm pays for the hard infrastructure – things like the rabbit proof fence, the hard line irrigation. The soft infrastructure – things like hoses, overhead watering, shade cloth, hand tools etc is paid for by me. Main benefits of being a plug-in enterprise? For me one of the main benefits was that the marketing had already been done (in the sense that the local community already loved the ferments, eggs and meat coming from this farm), and the space in the local market for fresh veg from Buena Vista Farm was there – so the community really, really welcomed it – I didn’t have to do any knocking on doors to sell my vegetables. 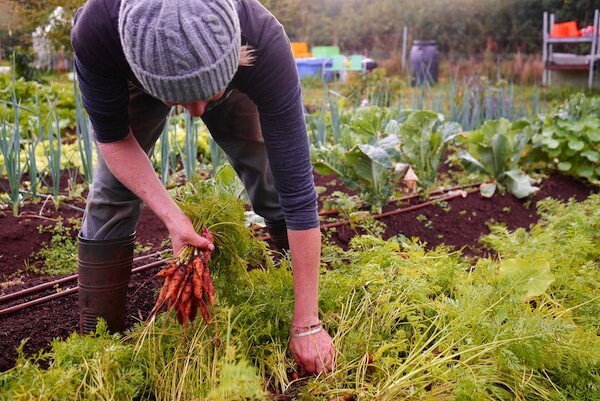 People were coming to me wanting local produce with literally zero food miles – so I could focus on the growing rather than the getting it out there. From Buena Vista’s perspective, its the fulfilment of the small farm model, really. 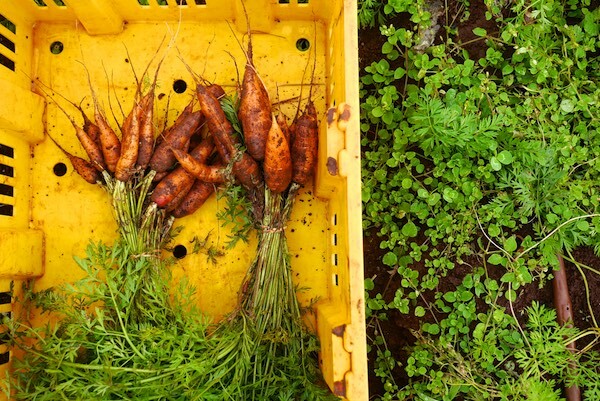 Good clean food of all types, grown right here. Operating as part of a larger farm also gave me the opportunity to use what skills I already had to create my own system – with input and mentorship and access to big tools like tractors, but with relative autonomy. 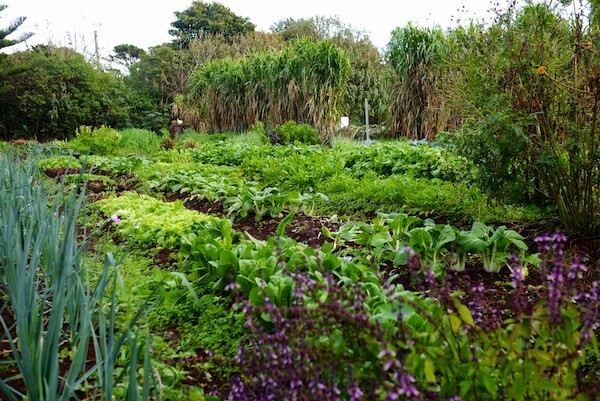 The Milkwood courses held here (Intro to Market Gardening, Biointensive Growing) have actually been another amazing part, a really crucial part of it for me – I’ve met so many great people who’ve come here as students, the teachers – the benefits have been outstanding – amazing people and skills to have in the system. What have you got in the ground at the moment? 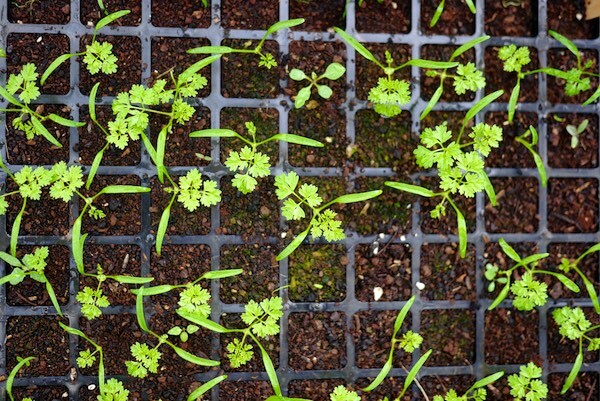 Are you mainly planning your planting for climate, or for market? A bit of both. 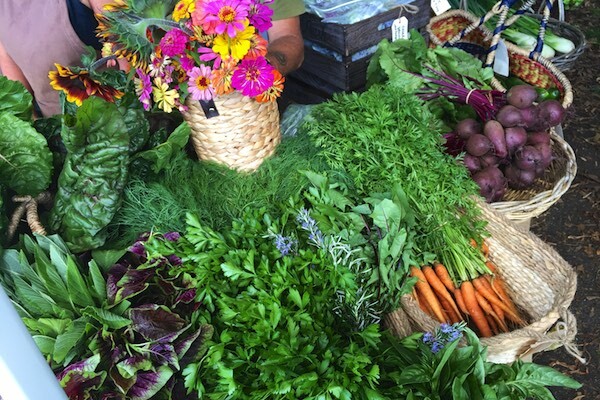 I’m slowly becoming more market driven, mainly due to the restaurants being very specific about what they want – unusual greens (not just lettuce mix) – wild greens, edible flowers, unusual leafy things, as well as beautifully formed root crops – carrots particularly, and fennel too. 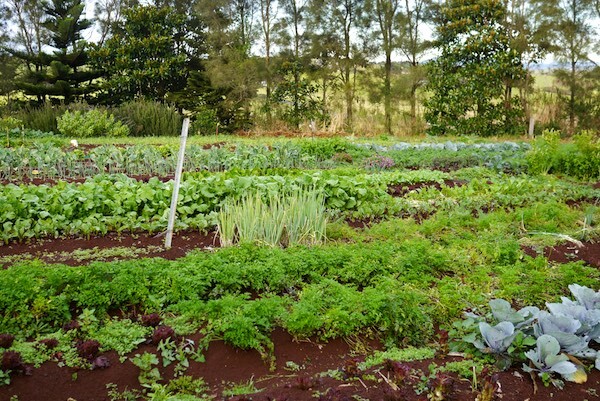 But I’m careful to respond to the seasons, too, and to this garden’s context – trying to grow what does well here, and focussing on quick turnaround crops that yield at least $20-25 per square meter in each harvest. 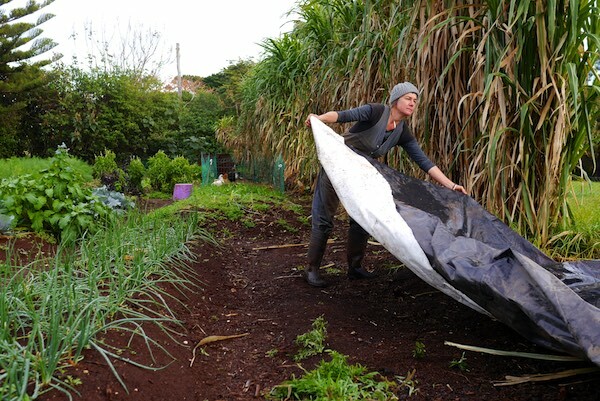 The biointensive method, especially when it comes to plant spacings and care, has been life changing for me – it’s created the opportunity to grow so much more in a small space, and because of the in-bed microclimate that goes with that tight spacing, the crops are so much more healthy for it – more robust. 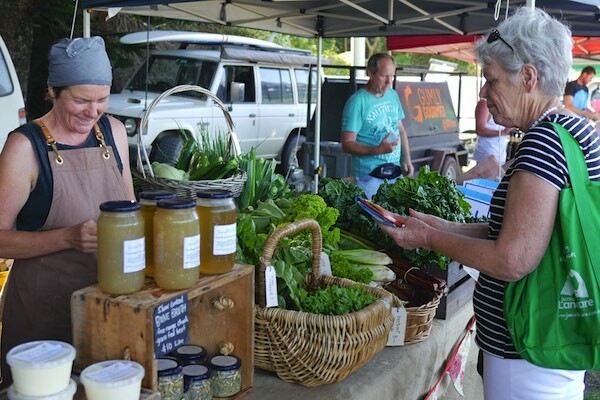 The main one is the Kiama farmer’s market that’s on every wednesday afternoon – when I started there were already Buena Vista customers who couldn’t wait to get their hands on more produce from this farm and so now we have customers can who do most of their weekly shop just at our stall, from bone broth through to radishes. This market accounts for about 80% of my weekly sales. Besides that, I supply to three restaurants / cafes in the area – Milkwood Bakery + South on Albany in Berry, and the Blue Swimmer at Gerroa – this sales stream is still quite small, and thats fine for me, just now. Oh and we’ve just started doing market bags for the on-farm workshops that are held here – so folks coming to a workshop can order a market bag of veg online before the workshop, and then I pick it on the day and present it to them at the end of the class – it’s a great outlet for the weekly surplus of whatever is ready right now. And what better to come to this farm, do a workshop and then leave with a bag of goodness! Square shovel – for clearing pathways and edging the beds. 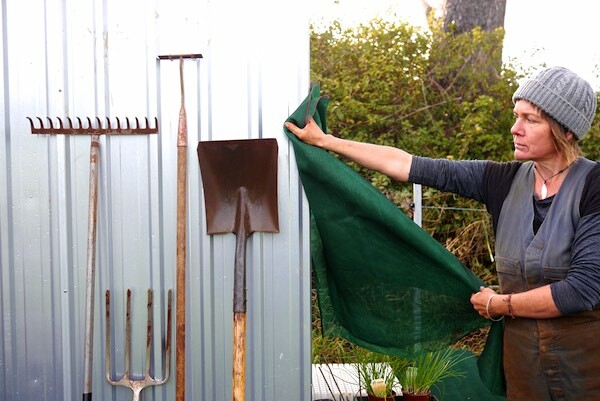 70% shade cloth – for covering beds, germinating in-bed seeds, best stuff ever. What’s your attitude towards pest control? 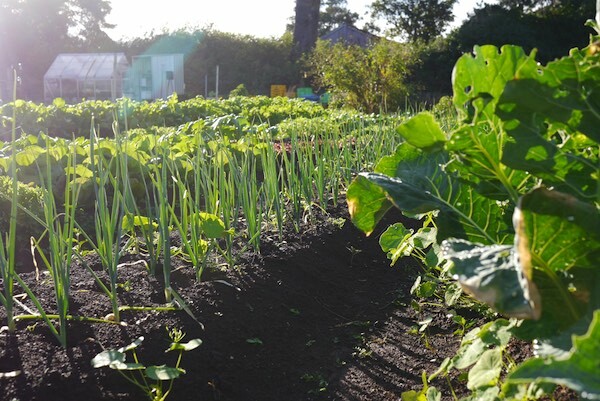 I try to grow only what vegetables like it here firstly, and then listen to the seasons, watch the weather and what’s coming, and build up the biology of the soil for strong plant resilience. You can make it really hard for yourself and grow some things that don’t do well in your particular context and struggle on through (an example for us was tomatoes – the lack of polytunnels and the prevalence of fruit fly here meant tomatoes turned out to be a waste of time). But if something gets smashed by pests or disease, I generally pull it straight out and cut my losses – if somethings not working, pull it out and get something else in there that’s going to work. 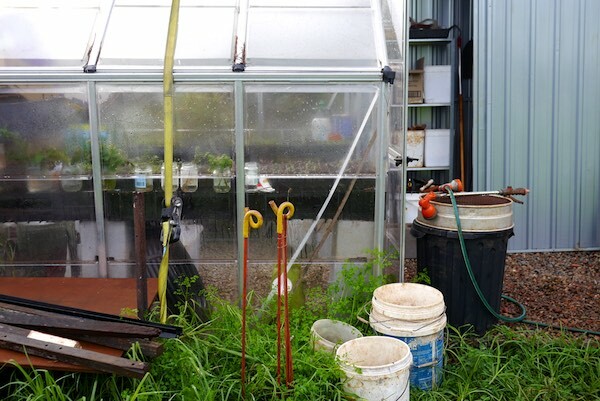 This one has been a costly lesson but you’ve got to be objective about it – and in this farm system you can put those crop losses back through the system in other ways – you can feed the crop to the pigs, the chickens, or compost it back through. And if a crop is just not doing quite what it’s meant to, and is not fit for market – there’s usually ways around it – my last crop of wombok cabbages didn’t head properly so were no good for market, but they were fine for Fiona to make Kimchi from. It all goes back into the system somehow. The scale that i started on, being only one relatively inexperienced grower. Not having the skill set to manage a garden of that size by myself was a steep learning curve, with 30 x 15m beds in blocks. I’m definitely feeling more confident after this first year of growing – its the whole immersion thing. To see the garden, like it looks now. To see where i am only 12 months after starting. I had no idea this is what it would all look like. It’s amazing. Any advice for beginner growers? Just do it – go and get the knowledge you need. 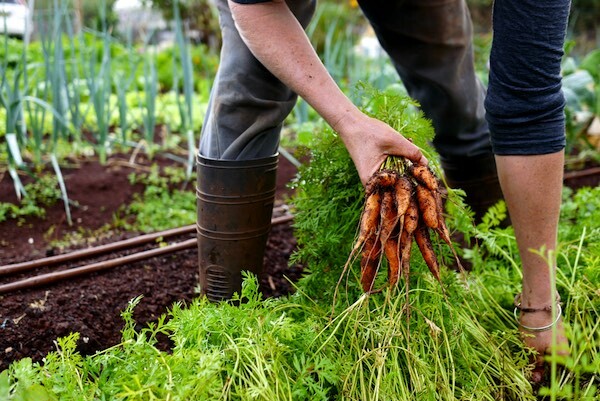 Volunteer on farms, Wwoof, get the experience, find your community, find the people you want to be around, make the most of the mentors you find along the way and go for it. 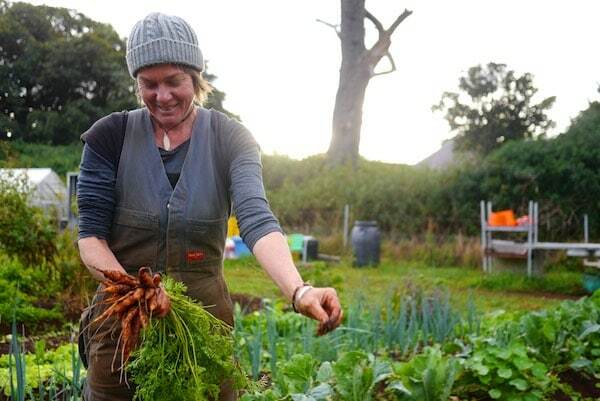 I have the most amazing community of knowledge around me, which started with Milkwood actually and the courses I did with you guys – especially the Permaculture Design Certificate and Intro to Organic Market Gardening. Its really important to immerse yourself in as much information as possible, and observe, observe, observe. Trust your intuition as it builds, and go for it. Thanks, Linda! 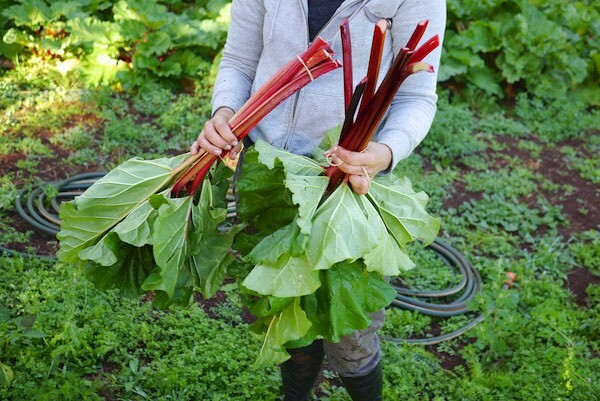 You can follow Linda’s adventures at her GrowFarmForage instagram. Inspired? 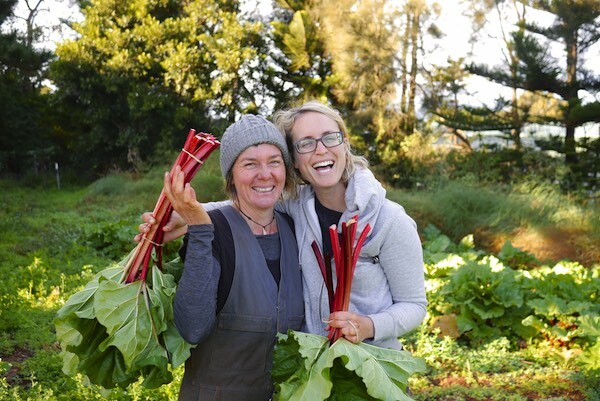 Here’s some more profiles of where + how Milkwood Permaculture Design grads have gone on to develop awesome enterprises that fuel local food + community. great interview! I love hearing different stories – particularly successful ones! good work guys. Sounds like something I’d like to do but on a smaller scale. At the moment though, I have no backyard let alone a house block to start with. Very inspiring story. It makes my heart sing to see and read how people are creating livelihoods that nurture their spirit and the earth at the same time. It’s where I want to get my food from.